Let’s start with the basics! Every ad on Google must be reviewed before it goes live. This is where Google ensure it doesn’t breach any of their policies. This means even though you have created the ad and enabled it, it can take up to a whole working day before running. The clue is in the name, Pay-Per-Click requires payment. Yet billing errors can be a big problem for PPC’ers, especially when working in an agency with different clients and therefore a selection of payment methods. This is an easy one to check, simply click on the gear icon on the top right of the screen and click billing which will display a screen showing any billing errors. Frequency capping is a feature for display campaigns which allows you to limit the amount of times your ads show to users. This is so they aren’t repeatedly seeing the same thing. If you or your customer has already seen your ad enough times it won’t appear to you again. That’s right, contrary to belief marketing isn’t all about spam! Ad rotation can be set to optimise for clicks, conversions or to rotate evenly. If you have chosen to optimise for clicks or conversions Google will show which ad they think is most likely to lead to these, which often results in one ad being shown the majority of the time, and so your other ad(s) in this ad group will rarely be viewed. Ad scheduling allows users to choose which days or times your ads appear, and so they will not appear outside of these times. The whole purpose in setting budgets is to not run over them. Which is why if your campaigns have used up or are using up your daily budget AdWords will stop or limit the running of your ads. If you or your clients are repeatedly searching for your own ads on Google but not clicking on them the ad may stop being displayed to you for a while, as their system will think you’re not interested in this ad. Instead, to view your own (or clients) ads, use the Ad Preview tool on AdWords so you can look at it as many times as you would like! If your keywords have a low quality score your ads will rarely show for these searches. This is down to the relevancy of the ads and the landing page as Google has deemed them not relevant enough to the search of the user. To improve this, you can look into changing the ad copy, the text on the landing page, and the keywords, all whilst keeping the customer and what they’re actually searching for in mind. Your ads will appear to the areas that you’ve targeted or to those who have an interest in that area. This can stop you from viewing your own ad via a search if you are outside this area. Instead, use the Ad Preview tool as spoken about before. Ok, so I couldn’t think of a ‘H’ word for outbid.. but I’m going to run with it. If your ads aren’t showing but you have a high quality score, it could be because you’re getting ‘houtbid’. This is because your ad rank is decided by quality score, expected CTR and max bids, and so if you’re competition has similar quality score and expected CTR the reason behind the outranking could be their higher bids. If you have run through these 8 steps and none of them seem to be the problem but your ads still aren’t running, scream!! And once that’s out your system feel free to get in touch with us to see if we can help. You could also chat to one of Google’s experts who are available on live chat via AdWords. 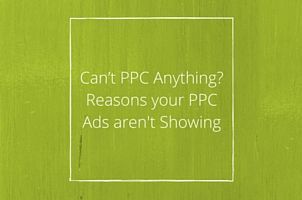 Contact our PPC solutions team today to learn more about our services 020 3813 7545.